Inevitably, upon looking at the Kareen MkII or MkIII, the knowledgeable gun owner will pronounce it to be an Arcus 94 clone. “Look at the beaver tail! Look at the squared off trigger guard!” And, in fairness, this is a reasonable assumption to make. They really do look similar… but only at first glance. Read on for more about this interesting piece of Israeli firearms history. Pictured is my KSN Industries Kareen MkII pistol. It is a clone of the Browning High Power (BHP). I don’t want to rehash the history and design of that pistol, so I advise you to consult Wikipedia on the subject. My Kareen came to me in rough shape, with bad springs, bad extractor, and some exterior pitting. I sent it out to one of the top BHP gunsmiths to have the slide refinished and have Novak night sights added to it. 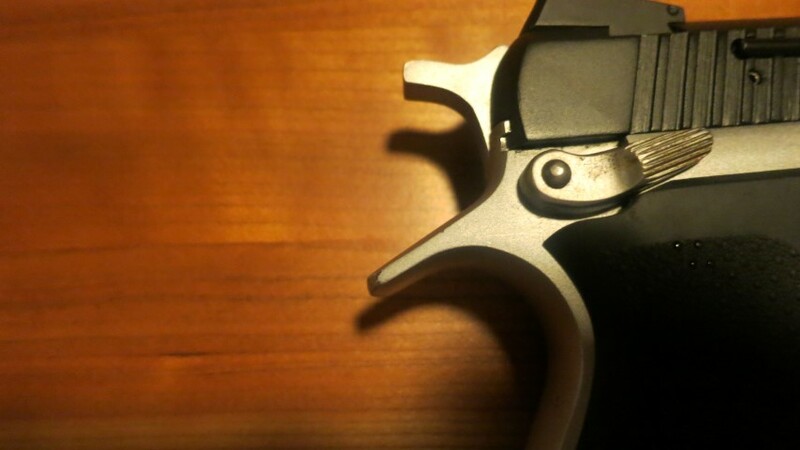 The grip is Hogue, but looks quite similar to the original MkII grips as advertised. Notice the unique trigger guard and beavertail I mentioned before. Mine is an excellent shooter, and has functioned quite well with every magazine I’ve tried. To the best of my knowledge, the Kareen variant of the BHP was never a service pistol in the IDF, but did see some usage by the Israeli police. The IDF used proper FN-built BHPs – you can find many surplus IDF BHPs on Gunbroker, if you are so inclined. FN even did a production run at one point just for the IDF. Thus. the Kareen was built for civilian sales – at home and abroad. Rumor has it that the US-based Israeli importers of the KSN Kareen Mk II and III, JO Arms, were not exactly the most enthusiastic business people on earth. Internet legend has them spending more time at strip clubs than selling guns. Less surprisingly, they went out of business – hence the CAI import marks on guns that had a rollmark for JO Arms. The first Kareens (Mk I) were assembled from FEG parts (or so Michael Kassnar has claimed – he imported the Mk I). Given that FEG built a perfect clone, the Kareen Mk I was pretty close to the original BHP The MkII and MkIII guns, however, are much more of a mystery. They diverge greatly from the standard BHP models. The shape of the trigger guard and the beavertail look quite a bit like the Bulgarian Arcus guns. However, on closer inspection, many angles on the gun are not identical to the Arcus guns. In particular, notice the back of the slide – the Arcus is straight, and the Kareen MkII is curved. Therefore, it seems probable that these were not simply imported parts reassembled into complete guns. However, there is also a timeline oddity – the Kareen MkIIs and the Arcus guns came out roughly at the same time in the early 90’s. Some sort of connection therefore seems likely. The barrels are marked with a Star of David. Supposedly, the Kareen was designed to handle the +P+ Uzi ammo that had wrecked so many Beretta M1951s. (Further evidence: the slide is thicker than a standard BHP’s slide – again, much like the Arcus.) Incidentally, the barrels are serialized – mine matches the frame. This makes me suspect the guns were assembled all at once in Israel, with at least Israeli-made barrels. 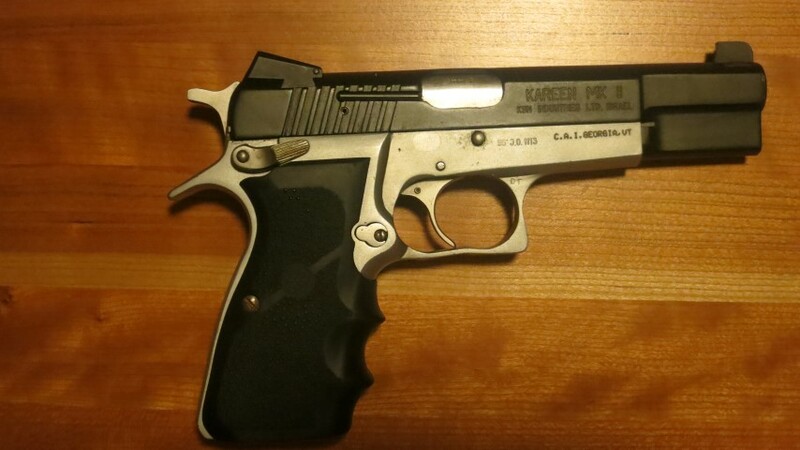 “Kareen”: this was the original pistol that was supposedly mostly made from FEG parts. Kareen MkII: the pistol shown in this article. Kareen MkII Compact: the Kareen MkII with a detective-length slide and barrel. Very few were ever imported. I’ve only seen one for sale, ever. Kareen MkII “transitional”: like the Kareen MkII, but with front slide serrations. Kareen MkIII: A cost-reduced version of the MkII transitional. Angular cuts are used on the top of the slide as it narrows to a nose. The back of the slide uses a pair of cuts instead of a curve. “KA-MkIII: Very similar to the Kareen MkIII, but uses what is clearly an Arcus 94 frame. Beavertail may or may not be present, and the trigger guard and dust cover are cut slightly different. The slide is cut on the back such that it’s a straight line – again, like the Arcus. I have seen compact versions of this gun. I am undecided about exactly what’s going on with the original Kareen. There are some anecdotes on the Internet that make me think it’s mostly FEG parts with some Israeli-made stuff. I really need one to look it over properly. I think the MkII and MkIII guns were made in Israel from rough Arcus frames/slides and domestically produced barrels and small parts. I think the KA-MkIII is 100% an Arcus gun, and was produced for Israeli domestic consumption. It isn’t labeled as a Kareen because the trademark was (is?) owned by JO Israel Arms. I actually saw one KA-MkIII online that had a compact-style slide that was stamped with Arcus 94C and KA-MkIII on it… that seems fairly conclusive to me that they were using finished slides and frames from Arcus, and at best restamping and assembling them. I would not consider the KA-MkIII to be a necessity for an Israeli gun collection. A most interesting article on the Kareen MKII and MKIII. I have been trying to obtain information on these magnificent Israeli guns since becoming an owner of a MKIII. 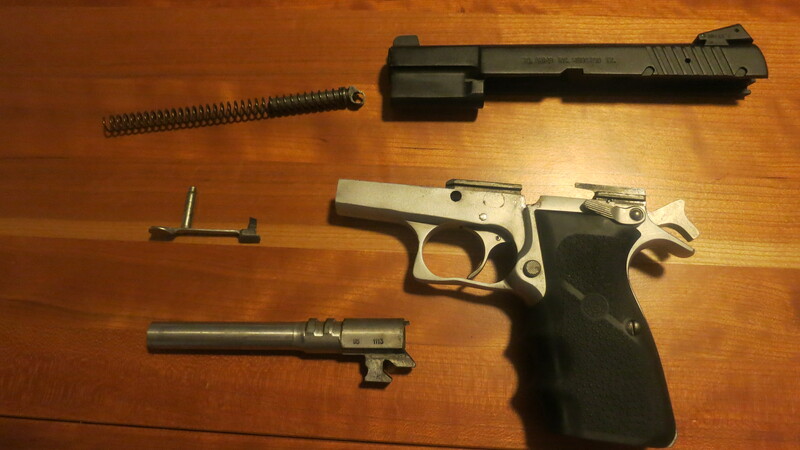 I too will be taking this pistol to a gunsmith for a general inspection and spring replacement, even though my Kareen arrived in much better shape than yours. I must confess, I believe your theory on the manufacture and assembly of these firearms, is probably much closer to the truth than what I’ve pieced together so far combing over various gun forum comments and articles. Yeah, I put up the article because I felt like too many people were just blathering that they were rebadged Arcus guns, which they’re clearly not. None of the MkIIs in that video have front slide serrations. This leads me to think that the MkIIs with front slide serrations were upgrades during production that eventually got marketed as the MkIII. Early in the KSN Kareen promo video on YouTube, the narrator states that the Kareen MKII was developed for the IDF. Towards the end, they spoof it as both an excellent combat and target pistol. My thinking is that it was used by the Israeli Defense Forces. I think “developed for the IDF” is basically a throw-away marketing line, it doesn’t mean it was ever used by the IDF. The Jericho had been introduced a decade earlier, and the IDF was never going to switch to a BHP variant. That said, it’s plausible that maybe it saw a bit of IDF use. Remember that the IDF is something of a sprawling, all-encompassing organization, and included what we could consider civilian police units in the US. I would not find it impossible to believe that the Kareen was used by some unit or a small number of officers, but I don’t believe it was ever generally issued like the FN BHPs were. Where you see more eclectic pistols are in the hands of civilians – individual carriers, shooting groups (eg, COHAI), municipal police, and.security contractors. These are the groups that KSN and BUL tended to target for sales, and are generally where CDI and Century are pulling from as they retire their old guns. You make perfect sense. I’m sure the FN Brownings (whether they were clones or not) had the lion’s share of the pistols distributed to the Israeli police and military. The logistical considerations providing arms to a country’s police and military, would most certainly have to comply with standardization (limiting the choices of gun models, ammo, and spare parts). Therefore the FN BHP’s again are the most logical choice. However, a Kareen, whether a MkI, MkII, or MkIII, utilizing most of the same internal parts as the BHP, (which I understand is the case with these pistols) would also comply within those standards. Perhaps the only way we’ll know for sure is if we knew someone within the IDF…. and even then, they might not reveal that information. One thing for sure about our Israeli friends, they’re pretty tight lipped when it concerns their security, and nobody will blame them for that. I was wondering who you sent the gun off to, to get those sights? And how much did it cost you thanks in advance. Don Williams at The Action Works (http://www.theactionworks.com/). I was not entirely pleased with how it went down – the gun needed three separate trips before everything was 100%. On the other hand, it runs pretty good now… so YMMV. Earlier this year I purchased a Kareen MKIII, a FEG PJK-9HP, and a vintage T series FN BHP. I call them the Three Amigos, and took then all into my gunsmith for spring replacement and inspections. The Kareen’s front sight needed adjusting, and I had the grips replaced with a NOS set of Uncle Mike’s black rubber diamond checkered ones. Once I got them back, I packed all three pistols up and joined my buddy (a very good shooter) at an indoor range mid week for 2 hours of comparison shooting. All shot well, but each a little differently. We preferred the FN BHP, as it had a better trigger action. The Kareen felt really good in our hands, and the FEG was a decent performer as well. The vintage FN BHP had what I call the original primitive sights; but due to the smoother trigger, our groupings were better with it. It was my buddy’s opinion, that if I stuck with one gun exclusively, and practiced with it, I would get consistently better groupings at 10 and 25 yards. My dad has the MKii and it’s been well used. There are some rough spots inside the barrel (where the bullet chambers) and it is occasionally jamming up. Im looking to replace the barrel, but I can’t find replacement parts! The BHP barrel is $300+ and the gun is worth less than that! Does anyone have suggestions? I have considered a gun smith, but I’m not sure if that would cost just as much. In theory, you should be able to buy a used barrel off Gunbroker or eBay have it drop right in. That said, polishing a rough chamber shouldn’t be a very difficult task for a gunsmith, either. Desiree, there’s a gun barrel for a Kareen MKIII currently listed on GunBroker.com (item # 580511501). I’d ask the seller (who has a pretty good rating) to send you images showing the inside of the barrel, as none of the four photos in the listing reveal what condition it’s in. Ninety dollars sure beats paying $300 from FN. Desiree, my bad, I assumed that the MKII and MKIII barrels are the same. They may be, I just don’t know. Best regards. I just bought a MK III with a broken front sight (I don’t know how you break a steel sight). I contacted Meprolight about using their BHP night sights; they weren’t sure that it would work and suggested that I contact the manufacturers (presumably FNH and KSN Industries) to find out if the sight dove tails are the same. Do you think that the Arcus 98 DA sights would fit in a Kareen Mk III? I don’t know for sure; I had mine cut for Novak sights. I don’t think it would be unreasonable to try out Arcus 98DA sights. My suggestion…. take it to a good Gunsmith, as they know how to do things and can advise you better than most “experts”. Honestly, even good gunsmiths tend to come up short on oddballs like the Kareen. Not their fault, they simply don’t work on many of them. Good point, as the one I use had not seen a Kareen MKIII before; but I believe he’s more than capable of solving most gun issues. If I didn’t I wouldn’t be using his services. 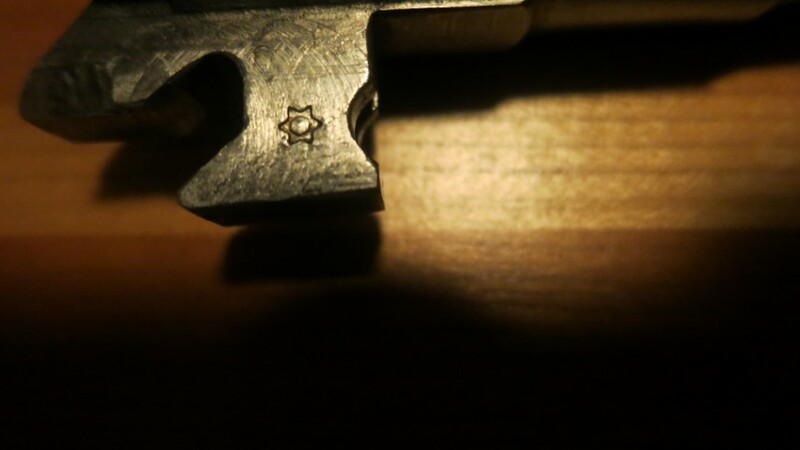 I recently picked up a Arcus 94c marked pistol, right side of slide. KA-MK lll 9mm on the left side of the slide. It appears to be a satin hard chrome finish. I really like it and it is the only one I have ever seen.